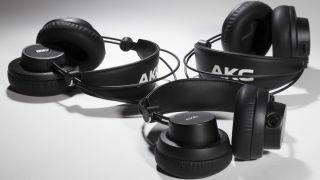 While Genelec is working on a software technology that it says will “redefine headphone monitoring”, AKG has announced the availability of a range of studio headphones that the company says are the first in their class to offer a foldable design. The K275, K245 and K175 promise an “unmatched” balance between sound quality and portability, with all sporting a three-axis, all-metal hinge. In fact, there’s plenty of metal throughout, and AKG says that all three models have been tested to destruction to ensure longevity (the cable is replaceable should it break). The K275 and K245 have 50mm transducers for greater low-frequency extension and detailed bass reproduction, while the K175 has 40mm transducers. AKG claims that all three models offer high levels of clarity and detail, the theory being that this will make it easier to create mixes that translate across multiple playback systems. Best-in-class sensitivity and low impedence are also promised. Of course, tech specs mean nothing if the headphones aren’t comfortable to wear, but AKG says that a self-adjusting headband, floating ear cups and “slow retention” foam ear pads ensure that you’ll enjoy having these cans on your noggin. A secure fit should minimise sound leakage, too. The K275 and K175 have a closed-back design, making them particulary suitable for live recording and monitoring, while the K245’s semi-open configuration puts them in the frame for editing and mixing work. The K175, K245 and K275 are available now, priced at £109, £129 and £149 respectively. Find out more on the AKG website.